"Little Worlds" & "Rabbit Holes"
The photos in this folder invite us to experience our world in ways that are unfamiliar and intriguing. 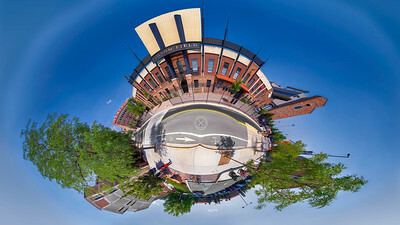 Instead of the usual image of some buildings and a little of their surround, a whole “little world” floats complete in a blue sky. 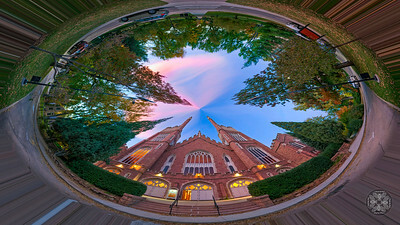 A full 360⁰ view is seen around the opening to a “rabbit hole”. The inherent distortion in these images gives an amusing caricature look. Most folks have never seen imagery like this, and that alone makes them intriguing. Seemingly mundane scenes can be made into surprising artwork. 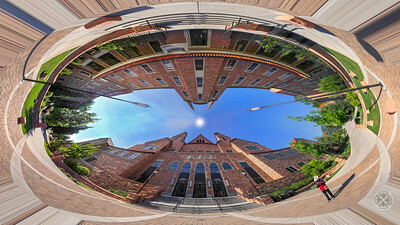 Most of these images were taken on the Boulder Colorado University campus. Its striking architecture, Spanish tiled roofs and flagstaff “bricks” make for lovely imagery. I’ve wanted to do a photographic study of this campus for years but was not excited about the “normal” imagery I had been taking. This 360⁰ format has finally given me what I was looking for. 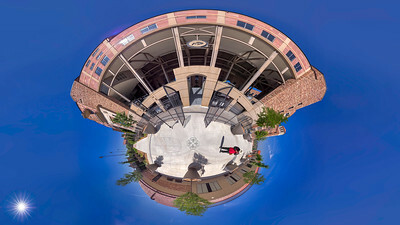 When I’m out with my conspicuous, motorized 360⁰ rig taking these photos, passers by often ask what I’m shooting. I say “everything” as I waive my hand around and smile. They typically say “Wow!” and laugh. 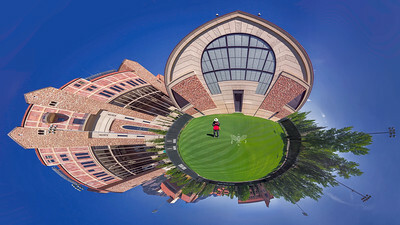 These photos are (mostly) shown in pairs, first a “Little World” view and then the “Rabbit Hole” view. These are two views of the exact same image (a 360⁰ spherical panorama). As you go from “Little World” to “Rabbit Hole”, your viewing experience is literally turned inside out. “Little World” and “Rabbit Hole” images have no up or down, no left or right. They can be said to be “always upright” no matter how you rotate them. They can also be said to be “always upside down”. How can they be both upright and upside down at the same time? Well, “Little Worlds” can be viewed at any angle of rotation and always look upright at the top, and upside down at the bottom. 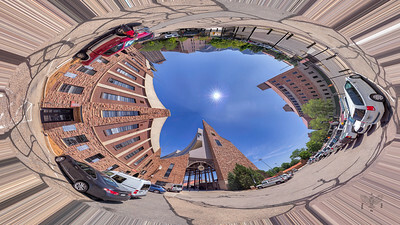 “Rabbit Holes” can be viewed at any angle of rotation and always look upright at the bottom, and upside down at the top. After viewing a “Little World”, one can become quite curious about how the “Rabbit Hole” version will look. It’s not easy to pre-visualize the transformation. Most of these photos are over 50mp and could be printed over 5’ wide with terrific detail. Many could be printed to fill the side of a large truck! Each photo here is made from a 500mp 360⁰ rectangular panorama. 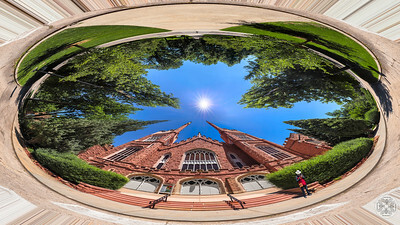 I make these panoramas from fifty 20mp images taken with an Olympus E-M1.2 camera using an oh-so-sharp Olympus M.Zuiko 17mm F1.2 Pro lens. The camera is mounted on a Seitz Roundshot VR Drive II motorized panorama head. It takes 3 minutes to shoot all 50 shots. Sunny day shots are typically done at 1/500th - 1/2000th second (and F5.6), so they do stop action. Nevertheless, static scenes work best because of the stitching of shots taken several seconds apart. I use Autopano Giga to stitch images together into the panorama, after carefully processing each of the 50 RAW images in Lightroom. Then I use Photoshop CC to make the final images. This professional equipment and software (together with 30 years of photography and Photoshop experience) yield professional results. 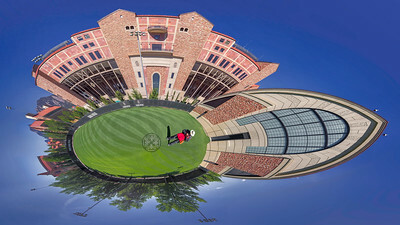 Changing the coordinate system of the 360⁰ panorama creates the “Little World” or “Rabbit Hole” image. 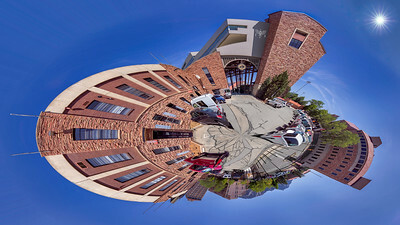 The “Little World” view is made by rotating a 360⁰ panoramic rectangular image by 180⁰, and then switching from rectangular coordinates to polar coordinates. The latter is done by a single menu command in Photoshop. A “Rabbit Hole” view is obtained by simply switching from rectangular coordinates to polar coordinates, sans rotation. 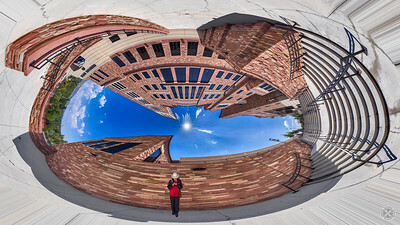 Initial 360⁰ rectangular panoramas always have a 2 to 1 aspect ratio, as they cover 360⁰ horizontally and 180⁰ vertically. “Little Worlds” and “Rabbit Holes” are traditionally done in 1:1 ratio, to give a round world. But I prefer a 16:9 ratio for viewing online or on my large 16:9 monitor, and a 4:3 ratio for iPad viewing. This way, the image completely fills the screen and thus looks larger. Larger images have more impact. Using a more rectangular format also provides some interesting artistic control. You can decide what part of the scene will be at the top and hence stretched more wide, or which part will be on the sides, and hence made more narrow. The effect can be significant. 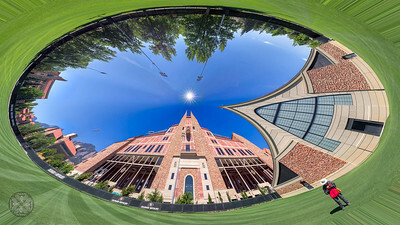 Moving camera position when making a 360⁰ panorama can have a dramatic effect, one that is hard to pre-visualize. 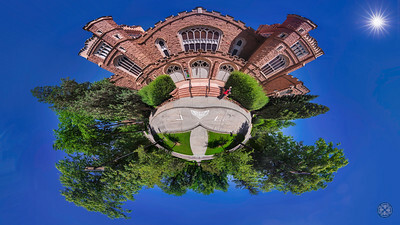 I usually take several panoramas from varying positions, and later pick the one I like best. The Photographer’s Ephemeris app can be helpful in determining when the sun will light up the front of a target building. I have been surprised how well detail is preserved when making these images. I was concerned that all the bending an stretching involved would cause allot of detail to be lost, but in fact, detail is actually preserved. The images are tack sharp throughout. These 360⁰ formats have been around for awhile. 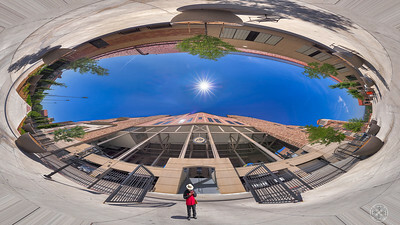 Today’s affordable 360⁰ still and video cameras, like the Insta360, are popularizing these formats for everyday use with iPhone and Android devices. My hope is that the images here help popularize these formats for use in large print and fine art photography. 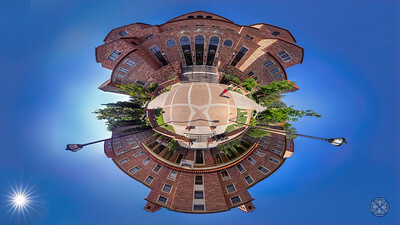 Taken on a sunny fall day in September, 2018, this panorama is composed of 28 images stitched together in Photoshop. It' is 180mp and could be printed 5' x 9' with terrific detail.